Ernest King was born in Lorain, Ohio, on 23rd November 1878. He attended the United States Naval Academy at Annapolis and graduated in 1901 (4/67). He joined the US Navy and during the First World War was on the staff of Vice Admiral Henry T. Mayo, commander of the Atlantic Fleet. After the war King was head of the navy's postgraduate school (1919-21) before becoming captain of a refrigerator ship. In 1922 King qualified as a submariner and later took over a sub-division. In 1930 King learnt to fly and was given command of the aircraft carrier Lexington (1930-32) until attending Naval War College. In 1933 he took over the Bureau of Aeronautics. King's next post was commander of Air Base Force where he was responsible for over 1,000 seaplanes. Promoted to vice admiral he insisted that his pilots trained for night operations. In January 1941 King was made commander of the Atlantic Fleet and after the Pearl Harbor disaster King was given the post of Commander in Chief of the US Fleet. King developed a reputation for being abrasive and argumentative. As a member of the Joint Chief of Staffs he often clashed with General George Marshall. King opposed plans to land the US Army in North Africa. He thought the most important area of concern was the Pacific War. What is more, he thought that the US Navy should play the decisive role in this as long as it was given adequate resources. King, General Douglas MacArthur the Supreme Commander of the Southwest Pacific Area, and Chester Nimitz, Commander in Chief of the US Pacific Fleet, decided that their first objective should be to establish and protect a line of communications across the South Pacific to Australia. This resulted in the battles of Coral Sea and Midway, where the Japanese Navy lost all four of her carriers. King insisted on launching the Guadalcanal campaign although General Douglas MacArthur claimed that the US Army was not ready yet for a major offensive. MacArthur also disagreed with invasion of the Soloman Islands. There was also conflict over King's view that American forces should bypass the Philippines. King also opposed Russian involvement in the Pacific War. He also objected to the idea that the Royal Navy should be moved to Pacific after gaining control of the Atlantic. 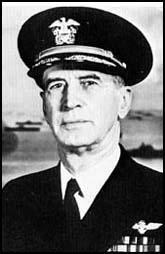 In December 1944, King, along with William Leahy and Chester Nimitz, was given the five-star rank of Fleet Admiral. After retiring in December, 1945, King lived in Washington until ill-health forced him to stay in Portsmouth Naval Hospital in New Hampshire. Ernest King died of a heart-attack on 26th June, 1956. Admiral King had an equally difficult task. His fleets had to hold Japan at bay while convoying millions of tons of supplies across the Atlantic to our allies in order to build up the stockpiles for the Second Front. He was an exceptionally able sea commander. He also was explosive, and at times it was just as well that the deliberations of the Joint Chiefs were a well-kept secret. The President had a high opinion of King's ability, but also felt he was a very undiplomatic person, especially when the Admiral's low boiling-point would be reached in some altercation with the British. King would have preferred to put more power into the Asiatic war earlier. He supported loyally the general strategy of beating Germany first, but this often required concessions of ships and war material which he did not like to make. He could not spare much as he was, until the last months of the war, working on a deficit in ships. America was fighting a two-ocean war for the first time in its history. (2) General Dwight D. Eisenhower made several references to Ernest King in his diary during the Second World War. 23rd February, 1942: Admiral King, commander in chief of United States fleet, and directly subordinate to the president, is an arbitrary, stubborn type, with not too much brains and a tendency toward bullying his juniors. But I think he wants to fight, which is vastly encouraging. In a war such as this, when high command invariably involves a president, a prime minister, six chiefs of staff, and a horde of lesser "planners," there has got to be a lot of patience-no one person can be a Napoleon or a Caesar. 10th March, 1942: One thing that might help win this war is to get someone to shoot King. He's the antithesis of cooperation, a deliberately rude person, which means he's a mental bully. He became Commander in Chief of the fleet some time ago. Today he takes over, also, Stark's job as chief of naval operations. It's a good thing to get rid of the double head in the navy, and of course Stark was just a nice old lady, but this fellow is going to cause a blow-up sooner or later, I'll bet a cookie. 14th March, 1942: Lest I look at this book sometime and find that I've expressed a distaste for some person, and have put down no reason for my aversion, I record this one story of Admiral King. One day this week General Arnold sent a very important note to King. Through inadvertence, the stenographer in Arnold's office addressed it, on the outside, to "Rear Admiral King." Twenty-four hours later the letter came back, unopened, with an arrow pointing to the "Rear," thus: (Here a long, heavy arrow has been drawn in a diagonal line underneath and pointing to the word "Rear.") And that's the size of man the navy has at its head. He ought to be a big help winning this war. (3) General George Marshall to General Douglas MacArthur after the Teheran Conference in November 1943. 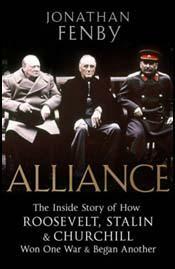 (4) In his autobiography, Reminiscences, Douglas MacArthur wrote about the rivalry with Admiral Ernest King. I called Marshall's attention to the fact that all naval disasters in the Pacific-Pearl Harbor, Macassar Strait, and the four-cruiser loss to an unscathed enemy in the Solomon Sea-had been under naval commanders; that in my area we had no naval losses of such character; that the Navy and the Air Force had no greater supporter and booster than I; that I felt it fantastic, to say the least, that inter-service rivalry or personal ambitions should be allowed to interfere with the winning of the war; that my naval units were among the most loyal and efficient elements of the command; and that I had publicly stated that, to secure unity of command, I would accept a subordinate assignment. He seemed to agree, but, having been chief of staff myself, I realized how impossible it was to have professional and objective matters decided on the basis of merit and common sense.